Shortly after arriving back in Virginia with Dixie, I discovered that she was a whole lot of dog for an inexperienced trainer and handler... a whole lot of dog. Raised on a steady diet of pheasants, chukars and pigeons, the young springer had an incredible drive. She would run "hell bent for leather" through our backyard inflicting massive damage on my wife Door’s meticulously manicured flower garden in search of the elusive and never to be found game birds. My training as handler had been, given the press of time, rudimentary, and clearly I lacked the skills required to rein in my young charge. What added to my problems of controlling Dixie was that she knew I was inexperienced. She shamelessly and exuberantly took advantage of me at every turn. "I believe that a well-trained dog in the hands of a neophyte will often sink to the level of the trainer. Therefore, my initial training sessions were as much designed to train myself as Dixie." This predicament extended to inside the home as well. In rapid succession, I lost one toe of my coveted Tony Lama boots. Gnawed to a misshapen lump of leather were a pair of loafers and an expensive pair of Door’s evening shoes (this did not sit well at all). I needed to gain control of the situation. Canines are much like small children (I am certain that this statement will set many child psychologists teeth on edge and perhaps propriety at naught). I quickly found that if I gave Dixie an inch she would take a country mile. Therefore, our initial training focused exclusively on obedience. Without any true plan or conscious thought, my obedience training with Dixie was grounded in several principles: discipline, exercise and affection - in that order. She was not allowed to escape correction for any minor infraction. This meant extreme consistency as well as patience. I found, through endless research of virtually every available flushing dog training book, that dogs are "position focused" in mentality and therefore must be physically put into the proper position. For example, to re-enforce the "hup" command I would physically push Dixie’s rump down on the ground while simultaneously repeating the "hup" command. When she moved off of the "hup" position, I would pick her up physically and place her back on the exact spot from whence she moved. I concentrated on indoor training to reduce distractions and then I moved outside to train her with multiple distractions (sights, sounds and a myriad of smells). I strove for consistency in the way in which I gave commands and corrections and coupled this with a heavy dose of patience. Weekly, I consulted with Tony to ensure that I was not inadvertently creating one problem as I endeavored to train her (and myself). These weekly telephonic interchanges greatly bolstered my confidence and helped me by pointing out flaws in my training regime that, left uncorrected, would likely result in unintended issues with Dixie. As a started dog, Dixie was well introduced to gunfire, quartering, field handling, all manner of game birds and the essentials of obedience. She was crate trained and house trained. However, I have found that started dogs in the hands of an inexperienced handler, which I definitely was at this time, tend to regress. Behavior that she would have never attempted with Tony she routinely tried on me. I believe that a well-trained dog in the hands of a neophyte will often sink to the level of the trainer. Therefore, my initial training sessions were as much designed to train myself as Dixie. We began with the basics: hup, heel and here. The three "h's" were more than sufficient for a start. Dixie is a very intense field dog who has the ability to focus incredibly on finding birds. This sharp focus, however, proved a daunting challenge for yours truly. I could recall her with four pips on the whistle, but as she approached me at a dead run with ears streaming behind her, she would veer to my left, circle behind me and then continue to hunt. We clearly had work to do here. With respect to the "hup" command, Dixie would "hup" momentarily but self release and begin to hunt when I took her lead off. Her heeling skills, much like many of the young field bred spaniels I have encountered over the course of my dog training career, needed much refining. And on walks, she would charge ahead in what we have dubbed as the "spaniel strangle". Both indoors and outdoors I concentrated on basic retrieving work using standard, relatively soft knobby dummies with the air valves. In retrospect, I think that these were too soft for basic retrieving work and may have created an issue with Dixie that I later had to fix. When she bit down on the dummy, the air valve would sometimes emit a slight squeak. This had the net impact of making the dummy into a squeaky toy. She was in essence rewarded for making the valve squeak and she in return would bite hard on the dummy to be rewarded. I later substituted the harder plastic dummies for the softer variety. I had targeted a Mid-Atlantic Hunting Spaniel Club hunt test in Pennsylvania in early November as my initiation into the world of dog games. How I dearly wanted her (and me) to perform well. We trained a little every day - usually about a half an hour at a stretch. The days were noticeably shorter as we approached the end of October and after daylight savings time, I was unable to come home from work during daylight hours to train. This further limited my training to indoor work and weekends. The hunt test was scheduled for mid-November and I truly did not know what to expect from the test. 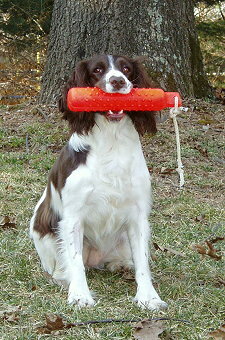 I had read the American Kennel Club Junior Hunter hunt test standards and rules for spaniels. I felt that Dixie could ably manage to meet the standard and pass the test. Door and I loaded the car very early on the morning of the appointed Saturday of the test. I had entered Dixie for only one day of the two-day event as a sort of experiment. The test grounds in Hummelstown, Pennsylvania were roughly three hours away and the test was due to begin at 8:00 AM sharp. Coffee made, Dixie in her kennel and me at the helm of the Explorer, we backed out of the driveway in pitch black darkness at 4:30 AM. The air was crisp and the sunrise was spectacular as we made our way north past the Catoctin Mountains in Marlyland to Hummelstown and the test grounds. As we pulled into the Blue Mountain Game Farm, we passed an Amish farmer, his weathered beaten face framed by the traditional straw hat, driving a flat bed wagon pulled by an enormous plow horse. 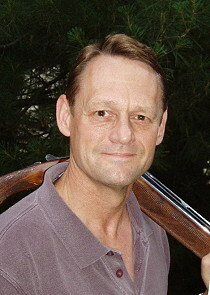 The first person that we met after checking in with the test secretary was Harold Bixby and Millie, his National Field Champion cocker spaniel, enroute to the Master Hunter land series. The consummate gentleman, Harold patiently explained the hunt test process to me. We watched awestruck as Harold put Millie through her paces. She would earn her Master Hunter title later that day. Dixie was number fourteen in the Junior Hunter running order so we had a little time to kill. We watched the Master Hunter and then the first part of the Senior Hunter series. This was the beginning of a memorable day; and our hopes were high. Dixie was straining at the bit, or leash in this case, as the marshal called our number. The head judge, Julie Hogan, well known in the east for her springers, briefed me on all the aspects of the test, "Your dog needs to find and flush two birds and retrieve at least one to within two steps of you. She does not have to be steady to flush and shot. Do you have any questions?" I had more questions than she possibly could have answered in the time allotted to me, but I held my tongue and nodded in the negative, my mouth dry in anticipation. Restraining Dixie mightily with one hand, the young springer was wild-eyed in anticipation. I simultaneously removed the slip lead with the other and gave her the "get out" command. She exploded off the line quartering beautifully - but a little on the wild side I thought in retrospect. She quickly made scent and with a full head of steam put up a chukar. The bird jinked left and then right; the left side gunner made a superb shot. He connected with a right to left crossing shot with the young dog hot in pursuit of the low flying bird. The bird cart wheeled into incredibly thick cover consisting of densely interwoven blackberry bushes at the edge of the field. Without hesitation, Dixie dove into the cover. Both the dog and fallen bird were completely obscured from my sight. I watched in anxious anticipation as the blackberry thicket shook with the frantic motions of a dog striving to get at the downed bird. The dog and bird drama was visible to the gunner, but completely invisible to me. I had not the slightest clue as to what was transpiring in the thicket. After a few anxious moments the shaking stopped. Thinking that Dixie actually had the bird in her mouth, I recalled her. I had made a fatal handler error. She returned without the bird and the judges rightly called this a failed retrieve - so much for my first outing. To be sure it was an extremely difficult retrieve in incredibly thick cover. But rules are rules and standards are standards. As a consolation prize, the judges allowed her to make the retrieve of hand thrown dead chukar and I accepted the bird. Well, accepted is probably a gross overstatement. I was able to get into range of Dixie with two giant steps and grabbed her by the scuff of her neck. Prying the bird from her mouth, I handed the chukar to the judge. I will never forget Julie’s comment, "Raw dog, but lot’s of potential." Door and I stayed to watch the Master hunt dead and water blind; we saw Serge Rasetta’s Remy, the first English springer spaniel to earn the coveted United Kennel Club Grand Hunting Retriever Champion title, as he earned his Master Hunter title. As the daylight began to fade, Door, Dixie and I headed back to Virginia. Watching those incredibly talented springers and cockers, I was dejected. I felt that there was no way Dixie could ever do what I saw those Master Hunter dogs accomplish in the field. This was to be the first of many, many $50.00 hunt test lessons with Dixie. Both of us had much work to do. Author’s note: this is the second in a series of articles that chronicle both the development of a talented young spaniel and the rights of passage of an inexperienced trainer and handler.